This front facing, ½ length, seated portrait depicts Mrs Tompson (aged 42) as a respectable woman of substance, posed on a double-ended [cedar] sofa (probably of colonial manufacture) with central scrolling carved back and out swept arms, black [sateen/horsehair] upholstery and a pinch-pleated, buttoned bolster. Her elegant day dress appears to be made of fine [silk] taffeta; originally blue in colour the [indigo] paint pigment has faded over time to a light olive green. Following the fashionably wide-shouldered look of the period, this silhouette is further emphasised by elongated, lobed (or van-dyked) ‘mancherons’ (epaulettes) spreading out over ‘gigot’ (leg of mutton) sleeves, full to the elbow and tight-fitting along the forearm, tapering to the wrist and marked with long peaked, black [velvet] cuffs. The form-fitting bodice has a series of pleats, rising in a V-shape across the corsage, either side of a centre front seam (possibly piped or boned), above a full skirt gathered into a pointed waistline. Mrs Tompson’s dark brown hair is horizontally arranged in large ‘sausage’ curls and possibly oiled. She wears an elaborate indoor cap comprised of layered, pleated frills of lace, or finely worked white-work (‘broderie anglais’) embroidery entwined with bands and bows of pale blue [satin] ribbon falling in long streamers over her shoulders. This cap appears to match her pleated sheer ‘fichu’, or kerchief, which has been folded to form a wide, flat collar emphasising the width of the shoulder-line of the gown, and fastened at the neck with a small rectangular gold pin [possibly containing a sample of brown hair] maybe a sentimental token or mourning brooch. With its exuberantly romantic attention to upper half of the sitter’s ensemble, overloaded with details of ribbons and lace, the pointed waistline of Mrs Tompson’s gown is indicative of a taste for the gothic after 1832, while its massive balloon-sized ‘imbecile’ sleeves clearly pre-date the dramatic mid-1836 change in mode which saw the collapse of the sleeve head and subsequent shrinking of the upper half of the silhouette. Jane Tompson, nee Amytage (1794-1871) was the second wife of emancipist farmer Charles Tompson (1784-1871), whom she married on 25 August 1822. The couple lived at ‘Clydesdale’, Windsor, until the property was sold in 1851. 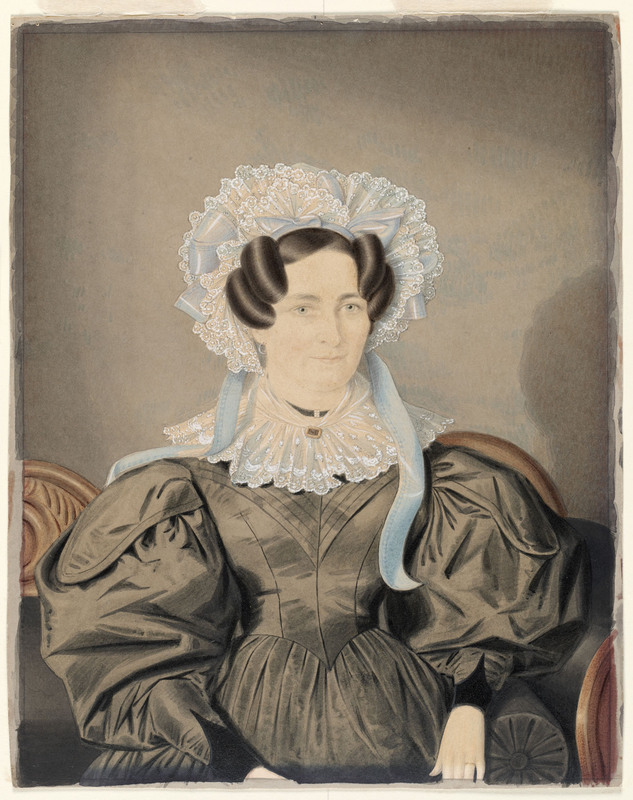 This portrait (as dated) would have been painted between the birth of two daughters in May 1835 and 1838.